Mahavir Jayanti, the occasion of birth anniversary of the twenty-fourth tirthankara, is celebrated every year by Jains across the globe. This year, Mahavir Jayanti will be celebrated on April 17, 2019. Lord Mahavir or Mahaveer, also known as Vardhamana, is largely believed to have revived Jainism. Information and facts about Lord Mahavir makes one understand his contribution to the field of spirituality and his contribution to Indian philosophy. 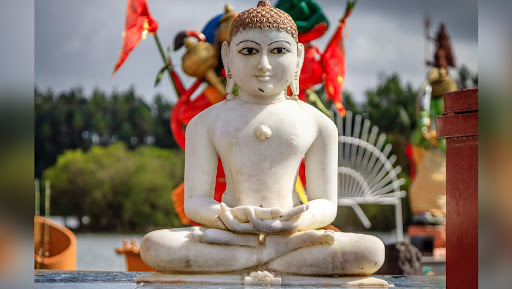 Mahavir Jayanti 2019: Date, History, Celebrations, Food and Significance of Jain Festival. Depicted in a sitting or meditative posture, Lord Mahavir is said to have attained Kevala Jnana- gaining supreme wisdom or complete understanding of the world and beyond. It is said that Mahavir achieved it after 12 years of intense meditation and ascetic lifestyle. Bank Holidays in April 2019: Ram Navami, Mahavir Jayanti & Good Friday Offs to Affect Banking Operations This Month. 3. Jain texts say that Lord Mahavir's childhood name was Vardhaman, meaning "the one who grows." 5. Lord Mahavir's birthday is celebrated on the thirteenth day of the rising moon in the month of Chaitra- which falls in March or April of the Gregorian calendar. On the day of Mahavir Jayanti, Lord Mahavir' statue is taken out for a procession on a chariot. On the Rath Yatra- chariot ride, the devotees chant religious rhymes and his contributions during the procession. The idol is then given a ceremonial bath, known as Abhisheka- coronation ceremony.